If you are new to the “live aboard” experience, we feel it is the best way to get the most out of your very valuable fishing days. You wake up each morning minutes away from putting your line into the water, and you can begin fishing as early as you want. The only schedules are the ones you set for the day. 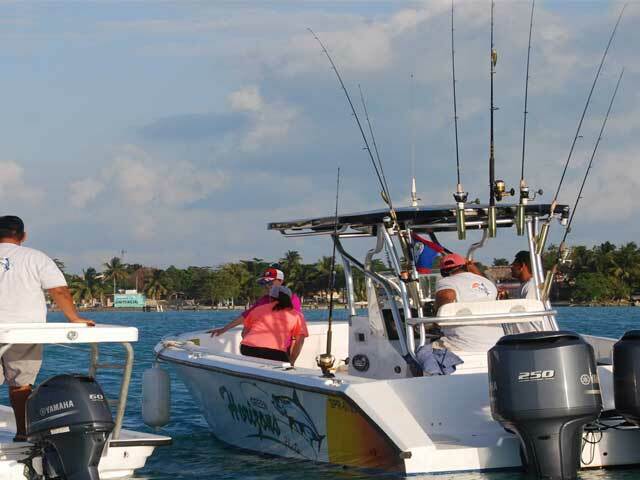 This is a fully-guided, live-aboard trip for up to 4 anglers of any skill level. Green Horizons Flats Fishing meets you at the Belize Airport. The drive north to your hotel is about 90 minutes, passing through villages, sugar cane fields, and roadside veggie stands. Lodging is at Orchid Bay, The Crimson Orchid Inn, www.thecrimsonorchidinn.com, where you spend your first and last night. Breakfast is included at the Inn and your hosts are Stephen and Morgan Honeybill. The Tradewinds Restaurant, a full-service bar, and restaurant is a short walk away. Your fishing days begin the next morning when we board a water taxi at the Orchid Bay pier to take us to Miss Lili and continue until your last day at sea, then we return to Orchid Bay by water taxi. Each morning we will board a flats fishing boat, cruising around and exploring the likely fishing spots among the mangroves and lagoons. At lunchtime, we can either return to Miss Lili for a bite to eat or take a box lunch to keep fishing and eat on board. In the evening, we relax over our fresh fish dinner and lots of good stories. This is your charter…you set the pace for the days. 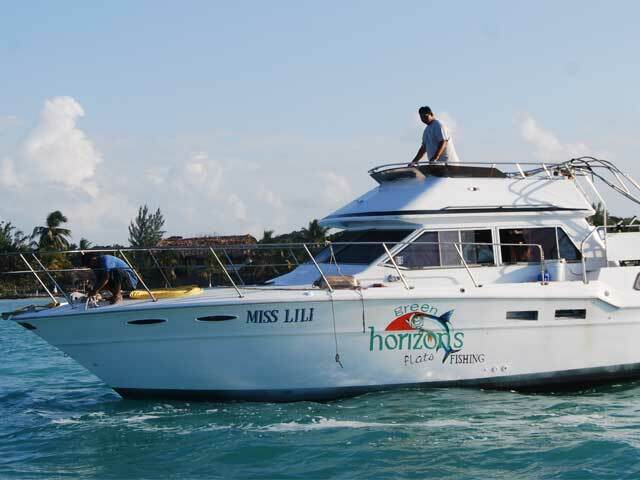 Miss Lili is well set up for your comfort, has a great galley, the latest technology, the most experienced Guides in this area, and a Captain and crew who promises to work hard for you. Catching the fish is up to you! 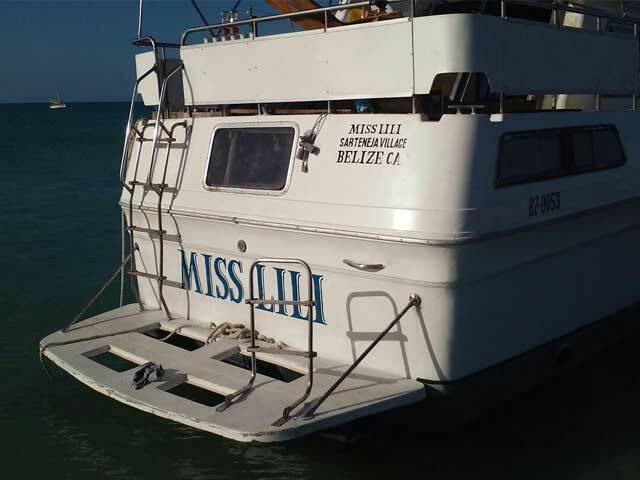 Included: Ground Transportation to and from Belize Intnl Airport, 2 Nights at The Crimson Orchid Inn (double occupancy) with breakfast, 6 days fishing, Fishing Guides, Captain and crew, safety gear, permits and licenses, all meals, snacks, water and soft drinks on board Miss Lili. Not included: Alcoholic Beverages (can be ordered in advance), Gratuities, lunch/dinner on your first day at Orchid Bay, and lunch/dinner on your last day at Orchid Bay. We can stock the galley with your favs – tell us what you like, we have a comprehensive list of gear on our Fishing Info page – Our Gear and What to bring.